"The situation in the northeast of Syria, where the US side is still trying to flirt with separatist-minded Kurdish groups, is concerning, as well as in the south of the country near Al-Tanf, where there is a de facto undisguised occupation by US forces of the territory of the sovereign Syrian state," she said. The spokeswoman further stated that the militants who had found a "safe haven, a shelter in the 55-kilometer exclusive zone," established by the US, were extorting $2,000 dollars per person from civilians who wanted to leave the area. Zakharova has also confirmed reports that the aerial attack on Russia's Hmeymim Air Base in Syria could have been controlled by a US spy plane. “This information, provided by our military experts, is absolutely relaible. We have repeatedly voiced our concerns in this regard. And, certainly, during our contacts with American partners, including along the military and political line. Our concerns will once again be brought to their notice." Her remarks come shortly after Russian Deputy Defense Minister Alexander Fomin said that unmanned aerial vehicles involved in an attack on the Hmeymim base were piloted by a US Poseidon 8 surveillance aircraft. He, however, didn't specify when exactly the assault took place. Addressing Washington's potential withdrawal from the 1987 Intermediate-Range Nuclear Forces Treaty (INF), Zakharova said that Russia was calling on all nations to send an "unambiguous" signal to the US to preserve the agreement. The diplomat stressed that Russia's missile programs, including development of cruise missiles, were carried out in full compliance with the treaty, and while Moscow intends to continue work with the agreement, Washington is unwilling to act on equal basis. "For several years, the American side has refused to provide any objective data supporting Washington's conclusions that the Russian 9M729 ground-based cruise missile that passed flight tests has the operating range banned by the treaty. We have repeatedly confirmed that the missile programs implemented by Russia fully meet our obligations under the INF Treaty," she underscored, adding that the development of the 9M729 cruise missile was "transparent to the maximum affordable degree. "The American side was never able to present any evidence to either Russia or the international community to substantiate its claims. They remain unfounded and are provocative. And we reiterate that Russia strictly abides by the provisions of the treaty," she added. “Now we are forced to seriously warn Washington. 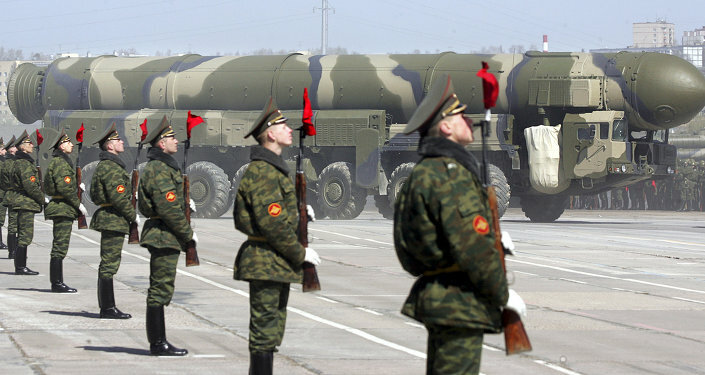 If the American side undermines the treaty, Russia will have to react. We are ready to work on maintaining its [the INF] viability, but for this we need a partner who is responsible and interested in continuing the dialogue for the sake of world stability. A solution to the problem can only be found through a frank, equitable and, of course, constructive dialogue," she said. Her remarks came just days after Donald Trump told reporters he would scrap the 1987 INF treaty, citing Russia's alleged violations of the agreement on the development of ground-based intermediate-range missiles. Moscow has repeatedly rejected the claims and pointed to possible US violations of the treaty with its missile defense installations in Eastern Europe.